*Free with RSVP but not required. 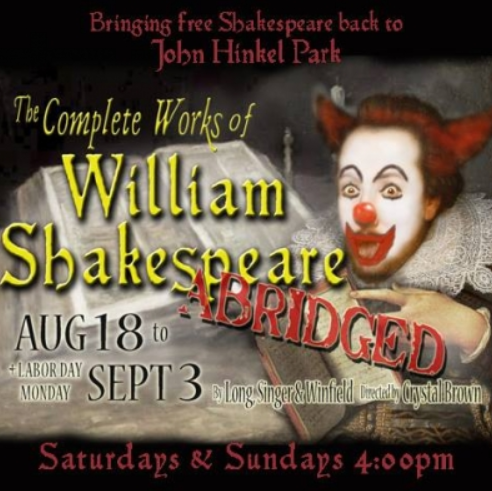 “Noises Off!” meets Shakespeare in Actors Ensemble’s inventive adaptation of “The Complete Works of William Shakespeare, Abridged” playing free at 4 pm weekends in the John Hinkel Park Amphitheatre through September 3rd. 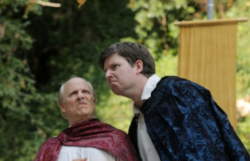 In this version, adapted by Vicki Siegel and Crystal Brown from the original work by Winfield, Singer and Long, 9 ingenious and irrepressible actors tackle all 37 of Shakespeare’s plays in one wild, madcap, 105-minute mashup – if they don’t tackle each other first. Presented free-of-charge in the beautiful John Hinkel Park Amphitheatre, which consists of a series of stone terraces – bring blankets, cushions and/or low lawn chairs – and bring some layers because it can get cold close to 6 pm. Wheelchair accessible – ADA-approved restrooms available. Reservations accepted but not required, but recommended for those with limited mobility – call 510-649-5999 or write info@aeofberkeley.org. Actors Ensemble is Berkeley’s longest-running theatre organization – since 1957.